The food and beverage industry has increased levels of automation to help meet food safety standards and personnel safety legislation. By taking a modular approach to automation, plant owners can gradually introduce new technologies and expand the number of automated processes, in order to maintain productivity and keep up with the latest safety legislation. Increasing levels of automation in industrial processes has required additional levels of safety and reliability to be introduced, which has led to, amongst other things, the adoption of the European Union’s new Machinery Directive ISO 13849 and a number of new standards such as IEC 62061. Within both of these pieces of legislation are details of increased safety functions, known as Safety Integrity Levels (SIL) or Performance Levels (PL) that categorise control components and structures with regard to fault detection, redundancy and reliability. Plant manufacturers and operators are required to carry out an assessment of the safety of their equipment and if necessary make improvements to bring it within compliance. One of the crucial aspects of this evaluation is the provision of emergency valves and stop procedures that prevent harm in the event of an employee intervening in a process. Taking the brewery sector as an example, the equipment used for brewing has access hatches and inspection chambers that should only be used when it is safe to do so. In addition, emergency stop circuits should be in place so that a process can be stopped quickly, should the need arise. The new directive has placed increased importance on the level of safety required in these circumstances, which may require additional investment by the plant owner. 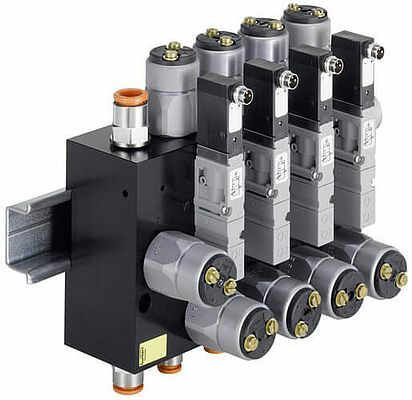 Many automated processes use pneumatic valve islands, connected to PLCs, to maintain the production process and any safety related circuits are separate from the valve island. Fortunately, in many cases the new standards can be achieved without massive alterations to the existing control infrastructure – a simple retro-fit can improve the safety levels and achieve compliance. Plant managers can upgrade existing control structures to PLc or SIL1 with a compact solution and minimal changes to the circuit. The only addition to the control cabinet is the safety relay, if it was not already present, which keeps both costs and space requirements to a minimum. In more demanding applications that require a higher level of safety, it is possible to introduce a redundancy valve block that will enable PLd or SIL2 to be achieved, which can apply to many applications in the hygienic sector where clean-in-place (CIP) procedures are used. In processes where an inspection hatch can be opened for maintenance for example, it is essential that the process must be stopped if a cover is removed at an inappropriate time. Under normal circumstances the safety valve on the pneumatic valve island will stop the process, but in situations where there is an increased risk, the redundancy block is positioned so that if the safety valve does not operate, then the process will be stopped by the backup valve. Bürkert offers a wide range of smart process valves and safety control valves that solve problems, reduce energy usage and increase productivity, as well as delivering an unrivalled design and development service here in the UK.